Saturday July 14th 2001: Bobby Valentine's reigning NL Champion Mets were having a bad follow up season. They were 40-52 at this point 12 1/2 games out of first place. In front of a big Shea crowd of 52,006 the Mets hosted Jimmy Williams' second place Boston Red Sox (52-38) in a nostalgic rematch of the 1986 World Series. 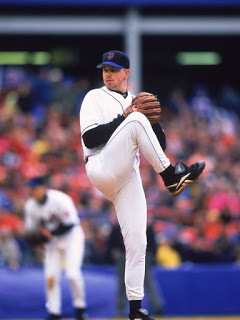 The Mets starter was Glendon Rusch (4-5) and on this day he would turn in one of the best performances of his career. In the top of the 1st, Trot Nixon bunted to third base & reached for an infield hit. This would be the only hit Rusch would allow all day, as he rolled through to the 8th inning. In the 5th inning he walked Scott Hattenberg, the only walk he issued on the day as well. The Sox had just three base runners all day, as Rusch struck out a season high ten batters. Rusch was relieved in the 9th inning by Armando Benitez who helped complete the one hit 2-0 shut out. It was the 22nd one hitter thrown by Mets pitching in team history. For the Mets it was outfielder; Mark Johnson who provided all the run support, as he hit a 2nd inning lead off HR, just his third of the year. He also drove in Desi Relaford after he had doubled in the 7th inning. Rusch would go 8-12 on the year with 156 strike outs in 156 innings of work. He spent three years with the Mets (1999-2001). The next year he was involved in the big three team trade that sent Todd Zeile & Benny Agbayani to the Colorado Rockies. Rusch & Lenny Harris went to the Milwaukee Brewers. 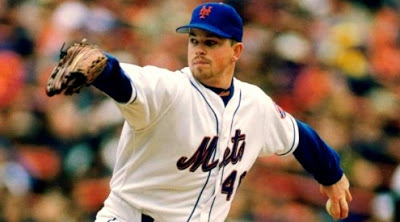 The Mets received Jeromy Burnitz & Jeff D'Amico in the deal. In 2002 Rusch would lead the NL in losses (16).